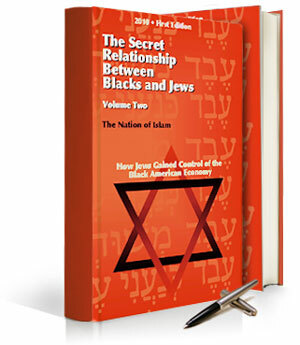 Purchase “The Secret Relationship Between Blacks and Jews"
(FinalCall.com) - The mercantile exploits of the Jewish people are legend. 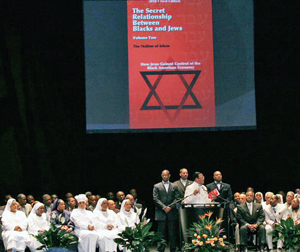 Their extensive commercial influence is undeniable, however, the Nation of Islam, in a seminal and groundbreaking work “The Secret Relationship Between Blacks and Jews,” Volume One (1991, Latimer Associates) presented a multi-layered and detailed research study of the methods by which this dominance was established and its connections with the Black community. Its publication set off ideological tremors resulting in denunciations, and chaotic scrambles into the archives of Jewish historical literature by those hoping to debunk its claims. They were unsuccessful, and quietly, the assertions that Jews were merely “co-sufferers or innocent by-standers” in the trans-Atlantic slave trade have been silenced. In 512-pages with thousands of footnotes, replete with charts, diagrams and even more Jewish scholarly sources, the Nation of Islam's research has shown that far from an accidental circumstance of history, Jewish business owners using the guidance contained within the Talmud, established an extensive structure of economic control while exercising considerable influence in the development of the architecture of the system of White Supremacy. The devastating effects of which are still felt in the Black community today. The book begins dealing with an historical reality, which shows that even though the Honorable Elijah Muhammad was never accused of being anti-Semitic, he and the Nation of Islam were feared by Jewish organizations and leaders. Those same organizational leaders in modern times predictably hurl the dastardly appellation of “anti-Semite” at anyone who would dare to act as a Black advocate for justice. As an example of this unfortunate reality, in the preface, the authors forthrightly deal with the 2008 presidential campaign of then-Senator Barack H. Obama and the Rev. Jeremiah Wright/Louis Farrakhan media created nexus and contrived controversy, which dominated the airwaves. In Chapter One titled “Blacks and Jews in the Jim Crow South,” the writers begin to outline the process by which slavery and White Supremacy became ironclad cultural realities. Throughout the book, it is shown that Jews in America consistently used the Talmud, their holy book of rabbinical wisdom, as an ideological tether as they sought to expand their cultural penetration and commercial presence. The Nation of Islam uncovered documents showing Jews built massive cotton marketing businesses owning thousands of acres of plantations. Indeed, much of the slave-picked cotton produced in the Mississippi Delta region was marketed internationally by Jewish merchants. Indisputably, Blacks picked the cotton. Jews simultaneously established their dominance in the “needle trades” or textiles industry, the banking industry as well as a significant—even if little known—role in the formation of labor unions, which allowed them to exercise control over jobs and contracts. After reading this detailed research it is clear why the prominent Jewish writer David L. Cohn would write that cotton was “a form of mysticism … a religion and a way of life … omnipresent here as a god is omnipresent.” (p. 197) It is also clear why the Museum of the Southern Jewish Experience in Jackson, Miss., could not ignore the “cotton factor” when speaking about the history of Jews in the south, along with the Jewish role in the Confederacy. These facts have remained virtually unknown to the general public. In the chapter “Forty Acres & the Jews: Heirs to the Slave Baron” readers will be floored by the extensive and seemingly ubiquitous network of Jewish bankers that was established across the South in a relatively short amount of time. Several pages of charts detailing their banking connections in 14 southern states are listed. Truly diligent researchers who want to go even further will be inspired to “connect the dots” between those bankers, their banks, and the “family ties” of their modern day manifestations. Some of the dots are connected for you, for example the recently collapsed investment banking goliath Lehman Brothers. A 23-year old German immigrant named Henry Lehman opened “a tiny general store” in Montgomery, Ala., in 1844. (p.206) Within six years, his two brothers joined him, creating what would become Lehman Brothers, all starting from that small store, which opened directly across from the town's main slave trading block. Predictably, as with Volume One, some critics will claim quotes and information is used in the book devoid of context, but what can possibly be out of context about the most prominent Jew in America at that time financing the Ku Klux Klan? In fact, Judah P. Benjamin, a noted KKK financier was the leader of the Louisiana Democratic Party (p. 122). What is “out of context” about the top rabbis claiming Blacks are “cursed sons of Ham” which incidentally became the foundation of the White Supremacist doctrine? How does one explain the fact that Jewish business owners not only survived but thrived in the Jim Crow South when the Ku Klux Klan—basically the military arm of White Supremacy—lynched and murdered Blacks with impunity. The accepted historical narrative is that Jews faced persecution on par with Blacks during that time. According to the research, this appears to be at variance with the facts recorded in writings by their own Jewish scholars. In fact, historical (and documented) Jewish support for the KKK in very real and, in modern terms, is tantamount to what is commonly called “material support for terrorism” per the Patriot Act. During a time of bloody and paralyzing violence in the South, led by the KKK, Jews erected ornate synagogues while holding interchangeable racial views and a deep bond of freemasonry, even participating in some of the anti-Black mob violence. Again, these are not opinions. The Nation of Islam, using reputable Jewish sources, compiled this information. The research has shown that even in areas where Jews were prominent religious and political leaders, violent attacks on Blacks still took place, without any words of condemnation recorded in the Jewish press. Some would find this to be quiet complicity, others may see this as tacit approval. Regardless, these are all topics that must be honestly discussed. The questions raised in this volume must be answered. Much of this information would never have been known, were it not for the research of the Nation of Islam. Many will embrace the book, others will condemn it, but one thing is for sure, its presence will not be met with silence. The question is, what will journalists, politicians, entertainers, professors, business owners, students and scholars do once they know the truth?